I saw my buddies Mark Honer of VM Ware and Dan Luderville from Gigamon speak at a Mirapath Sponsored Data Center Event. Now while I'm not much of a Data Center Infrastructure technologist specializing on the physical Underlay (Layer 1), I do like to sit in on events like these to see where the trend is going and what problems these guys are seeing. Mark is a very funny guy and likes to add humor in his presentations. 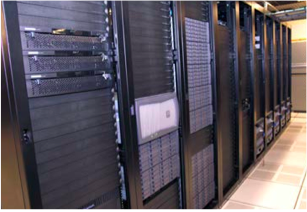 One of the topics of interest is the Data Center Best Practices. We do these in our lab, so while this may seem common sense, you'd be surprised at how many other labs and data centers I've seen that doesn't. I'll illustrate a few of them. 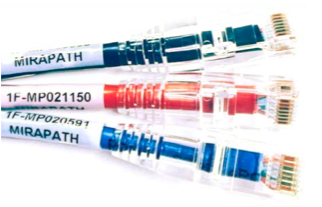 1) Use copper and fiber cables with unique serial number and lengths at both ends for tracing connections. 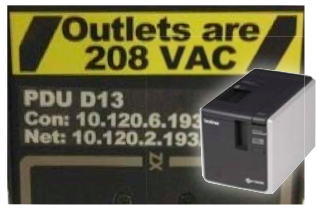 Now you don't need serial numbers for inventory purposes. Most cables don't come like this, but Mirapath can do this as part of your order. Saves a lot of time especially when the distance is more than 1 meter. The cool thing is that Mirapath keeps a record of your serial number so when you order more, you don't have to remember where you last left off. 2. Use blanks in spaces were equipment are not installed. First it keeps the airflow going and two it prevents people from using your equipment as a shelf. You should standardize around a particular color for each kind of connection. We use white for our management connections and red for our console connections. Whenever we see some other color connected to the switch, we know someone has thrown in a rouge device and can easily track down who did it. 4. Buy special colored power cables for critical devices. 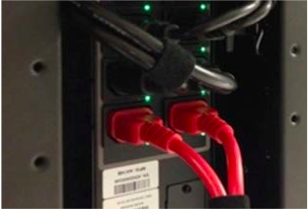 If all your power cables are the same, which usually come in black, someone might pull your critical device from the network because they might not know which cable goes to which device. Now if you have some that are red, then they know not to unplug that device. We call these the 'your fired' cables. We've had no incidents of accidental pulling of cables when we had these installed. 5. Invest in a nice labeler. You don't know how much time you can save if you just label things correctly. 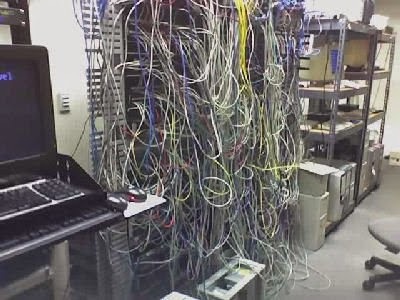 I used to spend many hours having to physically go back and forth between my desk and the rack just to figure out which hardware device I'm trying to find in the lab. If I had a labeler at that time to mark the devices with names, ips and basic information, I wouldn't have wasted my time. These techniques are good for the small and young companies who are growing. The right best practices can prevent your company into turning into one of these.